It’s Friday and it’s still winter so that means we’re still cold and Punxsutawney Phil is still prevailing. Well, unless you’re in North Dakota like our executive team was this week – where everyone is talking about the “heatwave” in the 40s. Either way, our field trips continue! We started last Friday with the Dakota language and today we are taking you on an Ojibwe language field trip. How exactly will these internet field trips work? Well, let’s say you wanted to learn about Ojibwe language. The first thing you’d do is go to Google (come on, everyone does) and search “Ojibwe Language.” So that’s what we did, and here are some of the useful resources we found. This is SUCH an incredibly helpful website. It lets you search for a word in Ojibwe or in English OR you can also search the cultural collections. For example- I typed in the word “apple,” selected the “Search in English” option and then hit the “Search” button. It gives you the word in Ojibwe and even an audio tool so you can hear it. The dictionary was developed by the Department of American Indian Studies at the University of Minnesota so you can count on it being accurate. In a world of fake news don’t be making up fake Ojibwe words! NativeTech is a simpler website. Here you can pull up an Ojibwe Language Word List that covers everything from greetings to animals and even feelings and emotions. However, it doesn’t bring audio or phonetic spelling options. It is a good way to start so you can familiarize yourself with words and how they are spelled. Now, just when you think the first page of your Google search has given you all you need don’t forget to click on the “Videos” tab to see what’s available there also. That brings us to…. Sault College is located in Ontario, Canada which is home to a sizeable Ojibwe population. On their YouTube channel, they offer lessons on Ojibwe given by a professor. This is great for anyone who prefers learning in a more traditional type of setting. You also get some very cool sidebar explanations. For example- when hearing “boozhoo” (originally Nanaboozhoo) – if you’ve played Fish Lake, you’ve heard “boozhoo” while playing the game – which is Ojibwe for “hello,” it actually sounds a lot like “bonjour” in French! The professor gets into the history of the words and the French settling in Canada. He’ll also let you know if the arrival of the French had any influence on the Ojibwe language. Yes, there’s an app for that! 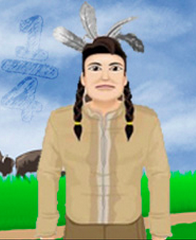 If you like having access to your Ojibwe lessons in the car or in transit then the Ojibwe app is where it’s at for you. You learn basic words and phrases. Best of all, the app is designed to work in remote communities, therefore, no internet connection is required! 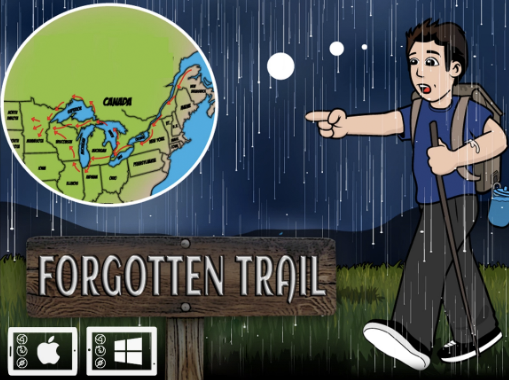 Three of our games: Fish Lake, Forgotten Trail, and Making Camp all have elements of Ojibwe history. As a player in Fish Lake, you get to travel across the Great Plains whilst solving fractions and learning about the migration of this great people. During Forgotten Trail, students get to join Angie and Sam as they retrace the steps of their Ojibwe ancestors. Don’t forget to avoid the rabid skunks! Lastly, during Making Camp you learn about math and social studies while making a wigwam. What’s a wigwam? Well, play and find out! Don’t forget to check out our Teacher Resource site also has an entire section dedicated Fish Lake, Making Camp and Forgotten Trail. The section contains free resources for teachers that include everything from clip art to powerpoint presentations and even videos from our own YouTube channel. Oh, and all the other pages and resources I mentioned on here during our field trip are free also! We hope you enjoyed your field trip on this fabulous Friday! Tune in for next week’s field trip about teaching fractions. Oh and don’t forget to stop by the gift shop on the way out!